I have been slowly working my way through Terry Pratchett's Discworld series and hadn't yet gotten to the Tiffany Aching books. (The entire world is broken down into smaller series and these are the later books in the Witches sub-series.) However, since I knew the final Discworld novel (and Pratchett's final book ... sob! ), was coming out in October, I decided to catch up beforehand so that I could cheer/grieve with everyone else. I started at the beginning of August with The Wee Free Men and fell instantly in love with not only the main character, Tiffany Aching, but with almost every side character as well. Then, about every two weeks, I picked up another of these books (or audiobooks) -- going from A Hat Full of Sky to Wintersmith to I Shall Wear Midnight and then finishing with The Shepherd's Crown on the morning of Readathon. I can't say enough good things about this series. The characters, many of whom are witches, are interesting and smart and complex. The plots are exciting and unique while being nestled in a coming-of-age master plot. The audiobooks, read by Stephen Briggs, are wonderful. (To be honest, having the audiobook helps a lot with understanding the Scottish-like brogue of the Nac Mac Feegle.) Through the series I laughed (a lot), gasped, and even cried. These books are listed as YA but I really think that's only because Tiffany herself is a tween/teen throughout the series. I didn't notice much difference between the writing in these books and in the other eight Discworld books I've read so far. If you are new to this series, the Tiffany Aching books aren't a bad place to start either. I will absolutely be buying my own copies of these five books for my personal library. 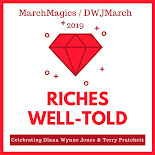 I plan to reread them often as I continue working my way through the approximately three dozen other Discworld novels that I haven't yet had the pleasure to read. 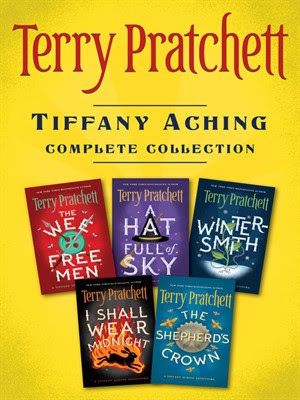 The Tiffany Aching books are probably the pinnacle of the Discworld books. They are just so good. I was a little worried about skipping ahead to them that I would then have some of the other books fall flat. The good news is that if one does fall flat (which, honestly, is likely) I can always pick up one of these and be instantly in love with Discworld again! I just started on a reread of these myself before reading The Shepherd's Crown, because it had been so long since I read the others. The Wee Free Men was so much fun and I can't wait to revisit the others. I agree they are for all ages! I really enjoyed reading them all in a three month span, being able to stay in the world for that long. I look forward to my first reread! I love these books, too! I am in the midst of The Shepherd's Crown now, and it's so hard to read with the beginning and all the talk of death... it keeps making me tear up. Totally! I thought I would be crying at the end but it was all at the beginning. So, The Shepherd's Crown is good? It was super sad in parts (there's a death that you can't help but think Terry was writing partially about himself -- attending his own funeral like a true witch) and obviously shorter than it would have been in other circumstances but it is a good ending to the story. It was satisfying and bittersweet. Sigh. ALL the feels. So good. So, so good. I can't believe they're done. It makes me want to cry all over again but also just go ahead and read the ones we do have again and again!